Menard et al. (2015) Effects of meteorological and ancillary data, temporal averaging and evaluation methods on model performance and uncertainty in a land surface model, Journal of Hydrometeorology, e-View, doi: 10.1175/JHM-D-15-0013.1. Holmberg, M., Akujärvi, A., Anttila, S., Arvola, L., Bergström, I., Böttcher, K., Feng, X., Forsius, M., Huttunen, I., Huttunen, M., Laine, Y., Lehtonen, H., Liski, J., Mononen, L., Rankinen, K., Repo, A., Piirainen, V., Vanhala, P., Vihervaara, P. 2015. ESLab application to a boreal watershed in southern Finland - preparing for a virtual research environment of ecosystem services. Landscape Ecology 30: 561-577 doi:10.1007/s10980-014-0122-z. Akujärvi, Anu, Aleksi Lehtonen, and Jari Liski. 2016. Ecosystem services of boreal forests-Carbon budget mapping at high resolution. Journal of Environmental Management 181: 498-514. Vanhala, P., Bergström, I., Haaspuro, T., Kortelainen, P., Holmberg, M., Forsius, M. 2016. Boreal forests can have a remarkable role in reducing greenhouse gas emissions locally: Land use-related and anthropogenic greenhouse gas emissions and sinks at the municipal level. Science of the Total Environment 557-558:51-57. DOI: 10.1016/j.scitotenv.2016.03.040. Böttcher, K., Markkanen, T.,Thum, T., Aalto, T., Aurela, M., Reick, C.H., Kolari, P., Arslan, A.N., Pulliainen, J. 2016. Evaluating Biosphere Model Estimates of the Start of the Vegetation Active Season in Boreal Forests by Satellite Observations. Remote Sensing, 8, 580, DOI:10.3390/rs8070580. Pöyry, J., Böttcher, K., Fronzek, S.; Gobron, N., Leinonen, R., Metsämäki, S., Raimo Virkkala, R. 2017. Predictive power of remote sensing versus temperature-derived variables in modelling phenology of herbivorous insects. Remote Sensing in Ecology and Conservation, DOI: 10.1002/rse2.56. Metsämäki, S., Böttcher, K., Pulliainen, J., Luojus, K., Cohen, J., Takala, M., Mattila, O.-P., Schwaizer, G., Derksen, C., & Koponen, S., 2018. The accuracy of snow melt-off day derived from optical and microwave radiometer data- A study for Europe. Remote Sensing of Environment, 211, 1-12. Raivonen, M., Smolander, S., Backman, L., Susiluoto, J., Aalto, T., Markkanen, T., Mäkelä, J., Rinne, J., Peltola, O., Aurela, M., Tomasic, M., Li, X., Larmola, T., Juutinen, S., Tuittila, E.-S., Heimann, M., Sevanto, S., Kleinen, T., Brovkin, V., and Vesala, T.: HIMMELI v1.0: HelsinkI Model of MEthane buiLd-up and emIssion for peatlands, Geosci. Model Dev. Discuss., DOI: 10.5194/gmd-2017-52, 2017. Susiluoto, J., Raivonen, M., Backman, L., Laine, M., Mäkelä, J., Peltola, O., Vesala, T., and Aalto, T.: Calibrating the sqHIMMELI v1.0 wetland methane emission model with hierarchical modeling and adaptive MCMC, Geosci. Model Dev. Discuss., DOI: 10.5194/gmd-2017-66, in review, 2017. Ruosteenoja, K., Markkanen, T., Venäläinen, A., Räisänen, P. and Peltola, H., 2017. Seasonal soil moisture and drought occurrence in Europe in CMIP5 projections for the 21st century, Climate Dynamics, doi:10.1007/s00382-017-3671-4. Gao Y., Markkanen T., Thum T., Aurela M., Lohila A., Mammarella I., Hagemann S., Aalto T. Assessing various drought indicators in representing drought in boreal forests in Finland. Hydrol. Earth Syst. Sci. 20, 175-191, 2016. Mäkelä, J., Susiluoto, J., Markkanen, T., Aurela, M., Järvinen, H., Mammarella, I., Hagemann, S., and Aalto, T., 2016. Constraining ecosystem model with adaptive Metropolis algorithm usingboreal forest site eddy covariance measurements, Nonlin. Processes Geophys., 23, 447-465, doi:10.5194/npg-23-447-2016. Peltoniemi, M., Aurela, M., Böttcher, K., Kolari, P., Loehr, J., Karhu, J., Linkosalmi, M., Tanis, C. M., Tuovinen, J.-P., and Arslan, A. N.: Webcam network and image database for studies of phenological changes of vegetation and snow cover in Finland, image time series from 2014 to 2016, Earth Syst. Sci. Data, 10, 173-184, DOI: 10.5194/essd-10-173-2018, 2018. M. Mencuccini, F. Minunno, Y. Salmon, J. MartÃ­nez-Vilalta, T. Hölttä (2015). Coordination of physiological traits involved in drought-induced mortality. New Phytologist 05/2015; 208(2). DOI:10.1111/nph.13461. Böttcher K, Aurela M., Kervinen M., Markkanen T, Mattila O-P, Kolari P., Metsämäki S., Aalto T, Arslan A.N., Pulliainen J., 2014. MODIS time-series-derived indicators for the beginning of the growing season in boreal coniferous forest - A comparison with CO2 flux measurements and phenological observations in Finland. Remote Sensing of Environment 2014, 140, 625 - 638; DOI:10.1016/j.rse.2013.09.022. Web-application: ESLAB Municipal Greenhouse Gas Budgets. Information on the contribution of natural ecosystems to greenhouse gas sources and sinks in Finnish municipalities. 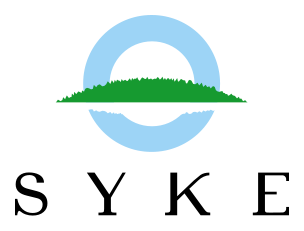 ESLAB: Information on the contribution of natural ecosystems to greenhouse gas sources and sinks in Finnish municipalities. Markkanen et. al., Evaluation of one-way coupling between a regional climate model and a land surface model. Poster session presented at: Global Vegetation Monitoring and Modeling International Conference, 2014 Feb 3-7; Avignon, France. Poster of MONIMET project presented, by Tuula Aalto, at Global Vegetation Monitoring and Modeling International Conference, February 3-7, 2014, Avignon-France. Poster of MONIMET project presented, by Ali Nadir Arslan, at the Arctic Science Summit Week (ASSW) and Arctic Observing Summit (AOS), April 5-11, 2014, Helsinki-Finland. Poster of MONIMET project presented, by Tiina Markkanen, at REKLIM Conference 2014: 'Our Climate - Our Future, Regional perspectives for Global future', Oct 6-8, 2014, Berlin, Germany. Holmberg, M., Aalto, T., Akujärvi, A., Arslan A.N., Liski, J., Markkanen, T., Mäkelä, A., Peltoniemi, M., Rankinen, K. 2015. Vulnerability to climate-induced changes in ecosystem services of boreal forests. Presented by A.N. Arslan in poster session at GEO-XII Plenary & Mexico City Ministerial Summit, 2015 November 11 - 13, Mexico City, Mexico. Presented by K. Rankinen in poster session at European Geosciences Union General Assembly 2016, 2016 April 18 - 22; Vienna, Austria. Rankinen, K., Holmberg, M., Markkanen, T. 2016. Vulnerability of boreal zone for increased nitrogen loading due to climate change. Presented by K. Rankinen in poster session at European Geosciences Union General Assembly 2016, 2016 April 18 - 22; Vienna, Austria. Böttcher, K., Peltoniemi, M., Tanis, M.C., Härmä, P., Arslan, A. N. 2016. Comparison of webcamera and satellite observations on vegetation phenology in Finland. Presented by Kristin Böttcher in the poster session at 19th AGILE International Conference on Geographic Information Science, 2016 June 14 - 17; Helsinki Finland. Rankinen, K., Akujärvi, A., Holmberg, M., Markkanen, T., and Peltoniemi, M. 2017. Assessing vulnerability to climate-induced changes in ecosystem services of boreal croplands and forests. Presented by K. Rankinen in poster session at European Geosciences Union General Assembly 2017, 2017 April 23 - 28; Vienna, Austria. Böttcher, K., Aurela, M., Rautiainen, K., Walther, S., Arslan, A.N. 2017. Satellite-observed phenology of boreal coniferous forests. Presented by Kristin Böttcher at the poster session of the 7th ESA Advanced training course on land remote sensing, 2017 September 4 - 9, Gödöllö, Hungary. 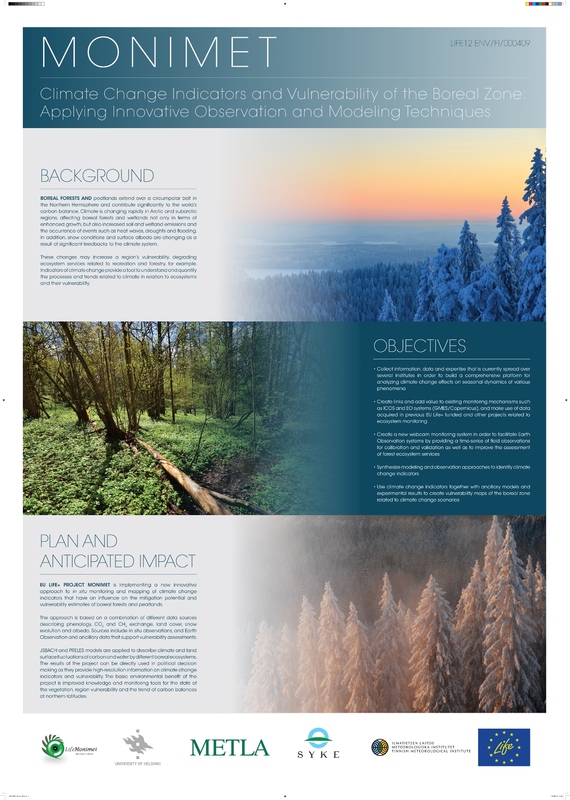 Poster session presented at EU Life+ MONIMET(LIFE12 ENV/FI/000409) Final Stakeholder Workshop on "Climate Change Indicators and Vulnerability of Boreal Zone Ecosystems", 2017 November 2; Helsinki Finland. Peltoniemi et. al., Phenology cameras observing boreal ecosystems of Finland. Poster session presented at European Geosciences Union General Assembly 2016, 2016 April 18 - 22; Vienna, Austria. Tanis, C. M., Arslan, A. N., 2018. An automated image processing system for multiple camera networks. Presented by C. M. Tanis at the poster session of Remote Sensing Days 2018, 2018 May 16 - 17, Helsinki. Finland. Oral presentation of MONIMET project, EU Life+ MONIMET project by Ali Nadir Arslan, at LIFE Platform Meeting May 14 - 15, 2014, Norwich, UK. Oral presentation of MONIMET project, Carbon Cycle Studies in Northern Region with a land surface model by Tiina Markkanen, at 2nd CRAICC - PEEX workshop, February 9-10, 2015, Helsinki, Finland. The survey on public awareness, conducted by Action C.2, was presented to the OpenNESS stakeholder meeting in Hämeenlinna on 9.6.2014. OpenNESS stakeholders were invited to participate in the survey since they represent the Vanajavesi region which is also key area for MONIMET project. Presentation, Satellite-observed start of vegetation active season in Finland and comparison with estimated from biosphere model. Presentation by Kristin Böttcher, at Geoinformatics research days, May 20-21, 2015, Helsinki, Finland. Presentation, Mapping carbon budgets in forested landscapes by Anu Akujärvi, at IUFRO Landscape Ecology, August 23-30, 2015, Tartu, Estonia. Presentation, Automatic digital image processing system for multiple camera networks. Presention by A. N. Arslan at Remote Sensing of the Cryosphere: Past - Present - Future, 2017 February 7 - 9, Bern, Switzerland. Presentation, Introduction of a new toolbox for processing digital images from multiple camera networks: FMIPROT. Presented by C. M. Tanis at European Geosciences Union General Assembly 2017, 2017 April 23 - 28; Vienna, Austria. Presentation, MONIMET Webcam Network, Database and Toolbox for Monitoring Phenology and Snow Cover. Presention by A. N. Arslan at International Conference: Snow - An Ecological Phenomena, 2017 September 19 - 20, Smolenice, Slovakia.